Biotransformations are very rapidly evolving methods for the production of bulk and fine chemicals. It is the goal of this summer school to introduce highly motivated postgraduates and postdocs from industry and academia at an early stage of their career to the interdisciplinary challenges of biotransformations. 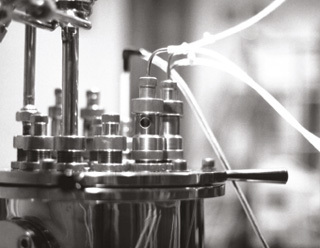 At the summer school a wide selection of topics will be discussed, ranging from the newest biocatalysts and expression systems, aligned evolution, and large-scale screening through to approaches in biochemical engineering. Download the flyer of the summer school "Biotransformations 2017"
Addressed are outstanding PhD students, post-docs (scientists) from academia as well as young industrial researchers at an early stage of their career. Speakers will stay at least for one night to enable an intensive exchange and discussion among all participants. PhD students and post-docs should present a poster on their work. Therefore, it is mandatory that all applicants submit a one page abstract. The number of participants is limited, enabling close interactions of the young academics with leading experts in the field of biotransformation. At the summer school all accepted posters will be intensively discussed during the poster sessions. As a special feature of the summer school, each poster will be presented by the author in a "2 minute speed lecture" as a part of the official scientific programme.